Wilson & Hampton Painting Contractors, Southern California’s premier contractor specializing in “Green” contracting services, products and solutions, is committed to contributing to positive environmental impact in our world today. We are committed to using protective systems that protect and enhance our environment; principles that are known as "sustainability". 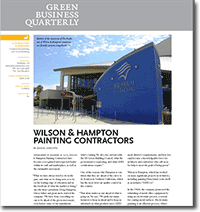 Wilson & Hampton are proud to be featured in Green Business Quarterly’s December 2009 issue. Our team has over 86 years of experience. We are contracting professionals who specialize in “green,” eco-friendly and long term solutions to fit your needs. Our services meet or exceed all current LEED standards, we are environmentally friendly and we will help you contribute towards satisfying credits under LEED. For more information on the LEED program and the U.S. Green Building Council please visit www.usgbc.org. We are fully insured with general liability and workers’ comp. We warranty all of our work at Wilson and Hampton Painting Contractors. Wilson & Hampton is EPA Certified to monitor Lead Abatement. Southern California is going “Green” and Wilson & Hampton Painting Contractors LEEDing the way! Our eco-painting services cost the same as regular painting services. We specialize in certified coatings to earn LEED credits, minimize impact to the environment, and minimize impact to building occupants. LEED Approved Products and Services. Complete Information about Wilson & Hampton Painting Contractors Painting Services.